Oromucosal use. 150 sprays. 13.2ml. Directions: Press firmly the top of the dispenser to release one spray into your mouth. Do not inhale while spraying to avoid getting spray down your throat. For best results, do not swallow for a few seconds after spraying. 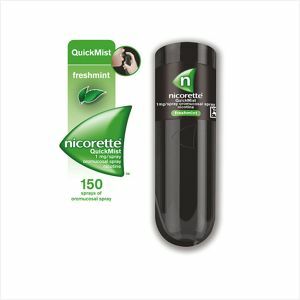 You should stop smoking completely before using Nicorette Quickmist. Use: Start by using 1-2 sprays when you would normally smoke a cigarette or have cravings to smoke. Use one spray first and if your cravings do not disappear within a few minutes use the second spray. If 2 sprays are required, future doses may be delivered as 2 consecutive sprays. For most smokers this means about 1-2 sprays every 30 minutes to 1 hour. For example, if you smoke an average of 15 cigarettes per day, you should use 1-2 sprays at least 15 times during the day. Start reducing the number of sprays per day after 6 weeks. The maximum dose is 2 sprays at a time or 4 sprays per hour. The maximum is 64 sprays over 16 hours in any 24-hour period. Contains ethanol. See enclosed leaflet for further information. If you have any heart, circulatory or stomach problems (including ulcers) ask your pharmacist or doctor before using Nicorette Quickmist. You are more likely to quit smoking when using this product with help from your doctor, pharmacist, trained counsellor or a support programme. Please consult your doctor if you need to use this product for any longer than 6 months. Nicorette Quickmist should not be used with any other nicotine containing product. Not for sale to or use by persons under 18 years of age. People under 18 years of age should not use Nicorette Quickmist. Close the dispenser every time after use to prevent use of the spray by children and accidental spraying.